All of the grid strategies we have covered so far have been those that enter the market on movements on the price axis. We call these horizontal or price axis grids. 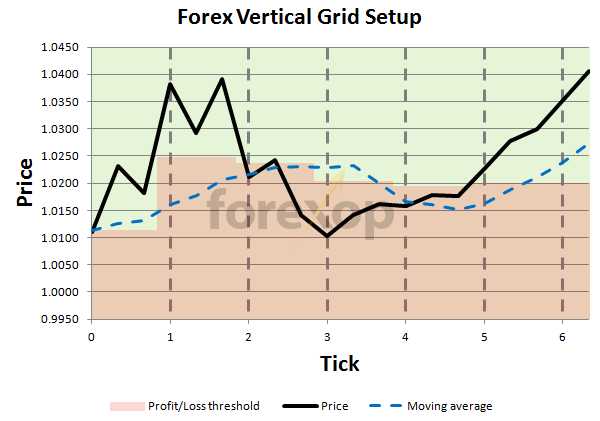 There is another class of grid that Forex traders use called vertical grids. With a vertical grid, the technique involves placing trades at intervals on the time axis rather than the price axis. This is a play on an old investment technique known as dollar cost averaging. The argument goes as follows. Proponents of the vertical grid strategy argue that trying to time the market by optimizing trade entry points is futile. They put forward the proposition that the market essentially does a random walk (at least on the short time horizon) and therefore it is impossible to predict short-term price movements in any reliable way. Instead of trying to time the market at an exact instant, with a vertical grid the trade block is spit into equal sized units and drip-fed at intervals into the market. So let’s say we want take a long position and will use a size of 1 standard lot. Using a vertical grid with 5 levels, the trade block is split up into 5 chunks each of size 0.2 lots. We then enter the market at set time intervals with 5 trades each of size 0.2 lots. Figure 1 demonstrates. The 5 trades enter at different points or market levels. Some may be at a higher price, some lower. Overall, the entry price will approximate the average over the time period chosen. The finer we split the trade block, the more closely the average entry price will converge to the average price over that time period. After opening the grid, once the price deviates from the average line (in the direction of the trade), the grid is closed at a profit. Importantly the grid trader does not care if one or two trades are in loss, provided the entire system is in profit. This is the principle of grid averaging. Trends are very commonplace in currency markets on all timescales. Yet often traders find it near impossible to profit from these seemingly predictable escalators (de-escalators) in price. The main reason for this is that market volatility will cause positions to be “stopped out” long before a profit is reached. In a trend, the entry timing of the trade is critical so as not to enter just prior to a sudden correction. In FX this problem is compounded because traders often use very high leverage and cannot afford to ride out a deep drawdown in the trend. 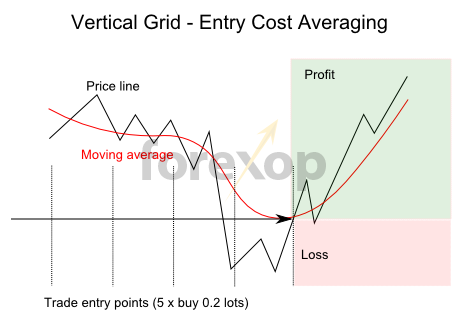 The vertical grid gets around this problem because it virtually guarantees that you will enter the market near to the average. If the average is rising (or falling in a downward trend) the profits will follow. This article will examine the vertical grid strategy in more detail. Suppose we see a rising trend, and decide to take a long position to profit from the upward move. To capture the trend we can use a vertical (aggregating) grid. The vertical grid will consist of a six trades each of volume 0.2 lots (total 1.2 lots). The trades are spaced at equal time intervals, that is an equal number of time ticks apart. The order book is shown in the table below. As with other grids, I recommend having one stop loss for the entire system rather than trying to manage each trade separately. Managing each trade individually negates the whole concept of averaging. Figure 2 shows the price chart plotted against the moving average. The green shaded area shows the profit region and the red/brown shaded area the loss region. The important thing to notice is that with each trade the average entry price of the grid system converges closer to the moving price average. In a rising trend we are then assured of entering close to the average. When the price line rises above the profit threshold (at T7) the entire grid is closed with a profit of 205.5 pips. You might say, why not buy once when the price is exactly at the moving average line? This would achieve nearly the same P/L as the grid. The key difference though is that it would not give the same degree of flexibility. The grid trader is not fully committed until placing the final trade in the set. On the other hand, the trader entering with a single block trade in one go is fully committed from the start. This is a tradeoff in terms of risk versus profit. If the price suddenly rallied before the grid is fully open, the grid trader loses potential profit. Whereas the reverse case is also true. If the price plummets after some bad economic news, the grid trader can abandon the position before being fully committed, thus taking a smaller loss. Note also that the time span of your trade entries must be of the same order as the trend you are trading. For example, suppose you were aiming to profit from a trend on the hourly chart. Using a grid with five trades each at five-minute time intervals would be of no use at all. This would only average over a twenty-five minute period. The span of the grid entries needs to be comparable to the cycle of the trend. 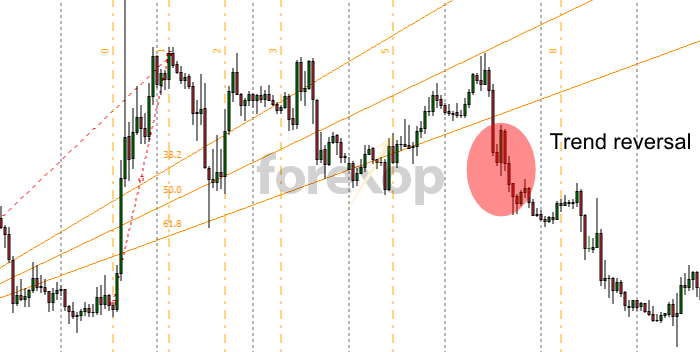 So if you are trying to capture a trend on the 1-hour chart for example, your trade entries really need to span several hours. The 10 grid entries can be every 2.4 hours and this will cover a span of one day. Your average entry price will be the average over the 24-hour period. Generally the more volatile the market, the longer the averaging time span needs to be (and the more trades you will need in the grid). With higher volatility, you need more samples to get a close approximation to the mean price. There are several variations to the vertical grid theme. One that is widely used is called mean divergence optimization. The idea with this is to use times when the price deviates from the moving average line to accumulate or reduce the grid position. For example, when going long in a rising trend the strategy grows the grid position only when the price is below the moving average line and reduces it only when above. Figure 3 illustrates the idea. This type of grid is often used by trading advisors and is run continuously where it accumulates and reduces the position accordingly. The direction only changes (going long/short) according to the long-term trend, for example the 4-week moving average. The exit condition (reducing) is based on closing the “highest profit” position first and running in a continuous cycle. This has the benefit of creating an incremental stream of realized profits. 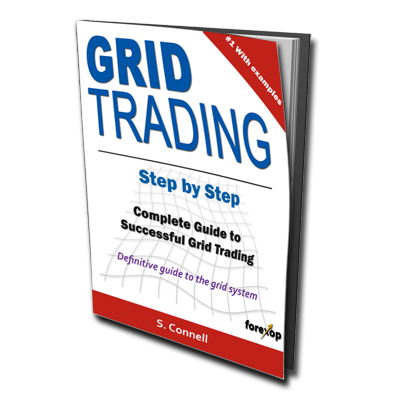 The grid also has a total stop loss whereby the entire system of trades is closed on reaching that limit. This triggers if there’s a sudden change of trend. The time intervals in a vertical grid do not necessarily need to be constant. 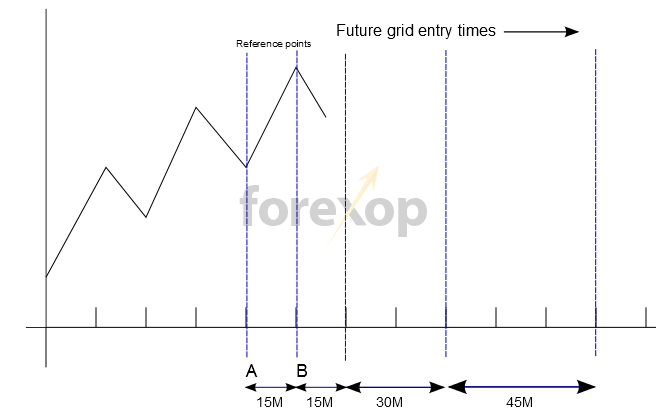 Some traders use time axis indicators to determine the entry time points. One such indicator is the Fibonacci timezone. 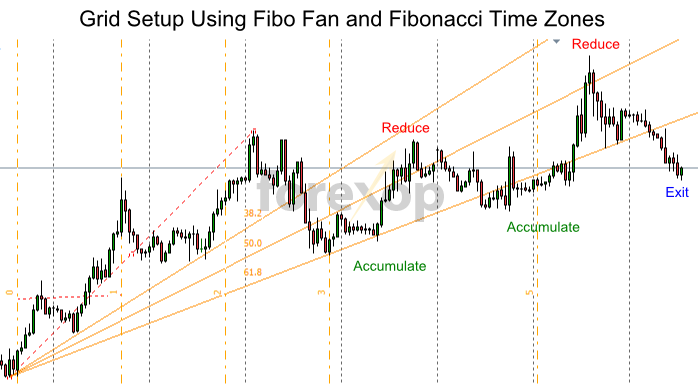 Fibonacci timezone is a standard chart object in MetaTrader and most other charting packages. Proponents of this idea say that significant market events don’t happen at regular time intervals. Rather they happen at intervals defined by the Fibonacci sequence. The way it works is to mark out retracement points along the time axis using Fibonacci numbers. These intervals mark likely pivot zones where price reversals could happen. Using this method the trade timings for the grid are set to coincide with likely pivots in the market. With fib timezones, the reference points, A and B are usually chosen to be two significant points on the chart, for example, between two high/low price levels. The fib zones can then be extended out into the future to give your grid entry times. If you don’t have software, fib timezones are very easy to calculate either by hand or with Excel. Points A and B are two reference points on your chart, let’s say they are 1 hour apart. The time interval between the grid trades is the sum of the previous two. We start with 1 hour (1 hour + 0hrs). Next is one hour also. Zone 3 is 2 hours (1 hr + 1hr), zone four is 3 hours (1 hr + 2hrs) and so on. Its important to note that with the fibo variants, in most cases the grid entry price will not converge to the average because the interval size is not constant. 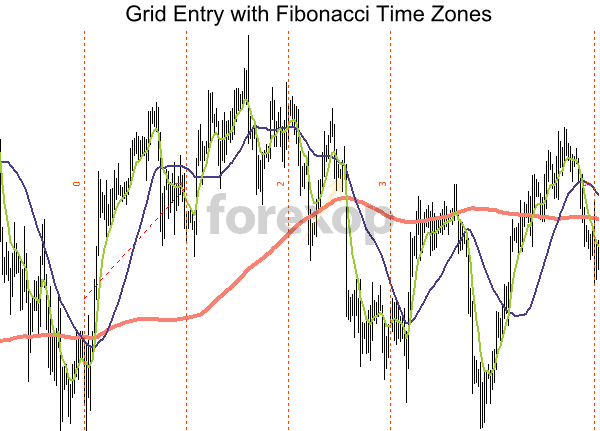 The Fibonacci fan (fibo fan) is another indicator that traders sometimes use to time the grid entries and exits. Fibo fan is a charting technique that extends support and resistance lines into the future. It works by locating peak and trough pairs. An ascending fan represents a bullish chart. The fan marks lines of support and resistance that the progressing trend will be likely to meet. Traders often use the fibo fan combined with other support and resistance lines to decide if the trend is intact or if it has changed. Elliott waves and the “pitchfork” are examples. Figure 6 shows both fibo fan and fibo timezones. The fan indicates a likely progression for the trend based on the peaks/troughs in the last section, whereas the timezones indicate potential entry/exit points. This grid technique would determine where the price is within each time zone and either accumulate or reduce the position accordingly. Typically, using the 50% line as the average, the trader accumulates the position when the price is within the green area and reduces when in the red area (see Figure 6). Whichever technique you use, you will need to have an exit strategy to close the grid when the trend changes course suddenly. With manual trading, visual inspection is often the best route. If you are programming the strategy as an expert advisor, there are several indicators available to help with this. In this case the grid is closed out before losses increase. Figure 8 shows an example. Here, the support at the bottom of the fibo fan has broken and the price has descended into a new bearish trend. At that point, the grid trader’s best course of action would be to close the grid following the significant breach of the lower support line. Vertical grids work well in trending markets. They are a play on dollar cost averaging as they aim to achieve an average entry price over a certain time interval. Thereby the trader has a higher chance of being able to profit from a rising (falling trend) which in the short term may be highly volatile. When used appropriately a vertical grid can reduce risk compared to “block trading”. It also adds flexibility to a trading program by allowing the trader to enter/exit the position in smaller units. 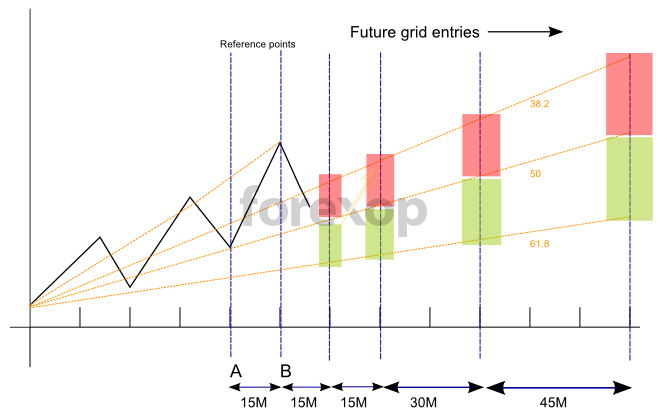 Used appropriately, grids are not profit multipliers, but rather a way of reducing timing risk in volatile markets. Thanks for this information. I’m interested in this subject to understand what I have been trying, by accident on intuition. Please check link on the box above, that’s the only profile page I use right now. You’ve answered your own question. If the grid is “locked in” then the profit or loss is already set. I have not understood if your grid-time system has any tp. Do you have a comulative one or a single grid tp? Secondly, T3 is down the moving average. Why do you open a buy? Are you meaning a daily chart? Yes there is a TP. Typically these grids have one TP for the entire system. The example given is an “averaging grid” so yes it can buy when above or below the moving average. The idea is that the price levels average out over time and we don’t try to optimize entry points as the price moves up or down. You have some examples on the H1 hour chart- Would it still work on any time level like on the weekly or monthly? Yes because actually longer trends are more stable than those on the shorter timeframes. The strategy is best applied where there are consistent trends and despite volatility the moving average line is clearly ascending or falling. bias for continuation of trend. Any grid ideas with a picture for this method?